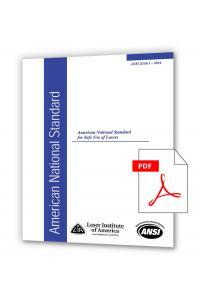 The ANSI Z136.1 - Electronic Version is a PDF version of the parent document and cornerstone of the Z136 series of laser safety standards, the Z136.1 is the foundation of laser safety programs for industrial, military, medical, and educational applications nationwide. Z136.1 provides guidance for the safe use of lasers and laser systems by defining control measures for each of seven laser hazard classifications. A practical means for accomplishing this is to (1) classify lasers and laser systems according to their relative hazards and to (2) specify appropriate controls for each classification Once a laser or laser system is properly classified, there should be no need to carry out tedious measurements or calculations to meet the provisions of this standard. However, technical information on measurements, calculations and biological effects is also provided within the standard and its appendixes. View a sample of this publication. Click here to view updates to the ANSI Z136.1. †If you need an older version of this standard, please call the LIA office at +1.407.380.1553. To view your electronic standard, log-in to your LIA Account and select the "Files" tab to see any electronic documents purchased.